Joel Embiid was ruled out for the game shortly before tip with Mike Muscala starting in his place. 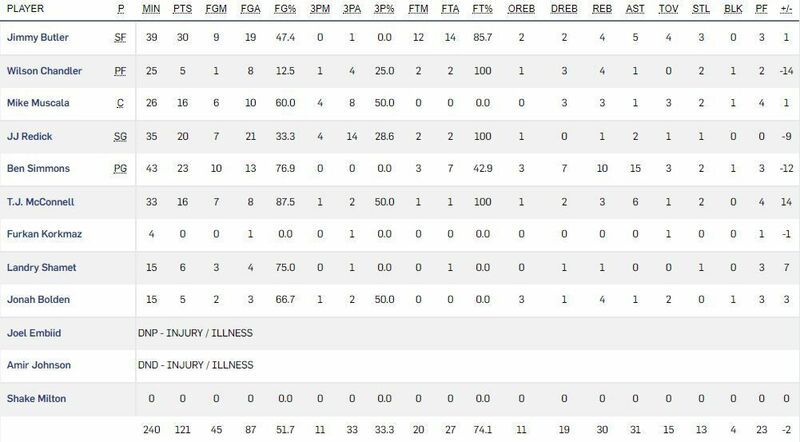 As a result, Brett Brown were some interesting small and medium lineups throughout much of the game. The story of the first quarter was the solid three point shooting from both teams, combining for 7/17 from behind the arc. The course of play was fairly sloppy and up and down with a fair number of turnovers and scrambles. 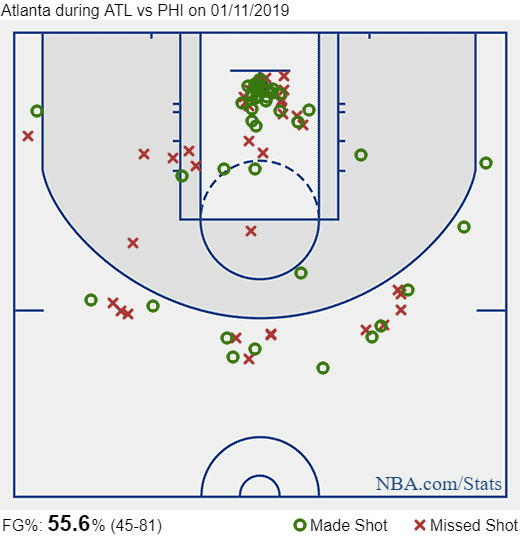 Mike Muscala rewarded Brett Brown’s choice to let him start by giving a strong offensive performance – one that I think most Sixers fans hoped would be the norm as a nominal stretch five, draining several jumpers and spot up threes in the first few minutes of action. However, picking up his third foul around 5:00 left in the quarter put him on the bench. The flood of turnovers for both teams continued unabated, leading to more frenetic up and down action and transition opportunities. By the end of the quarter Jimmy Butler had 16 points and was 6/6 from the line, whereas the Sixers’ bench contributed only eight points. 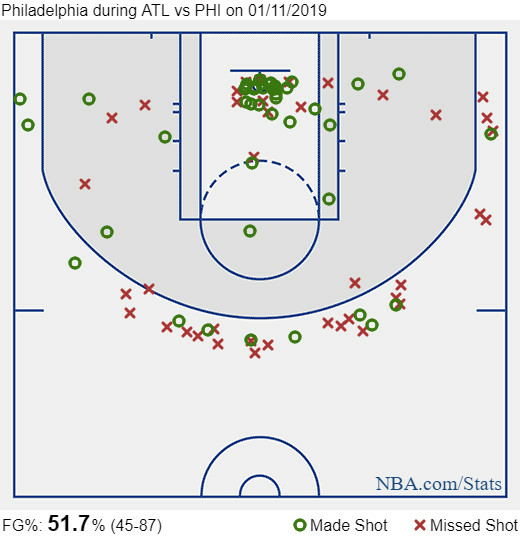 The Sixers started the third quarter with the same lineup as the start of the game, but Mike Muscala got the quick hook after picking up his fourth foul at the 11:00 mark (Jonah Bolden replacing). 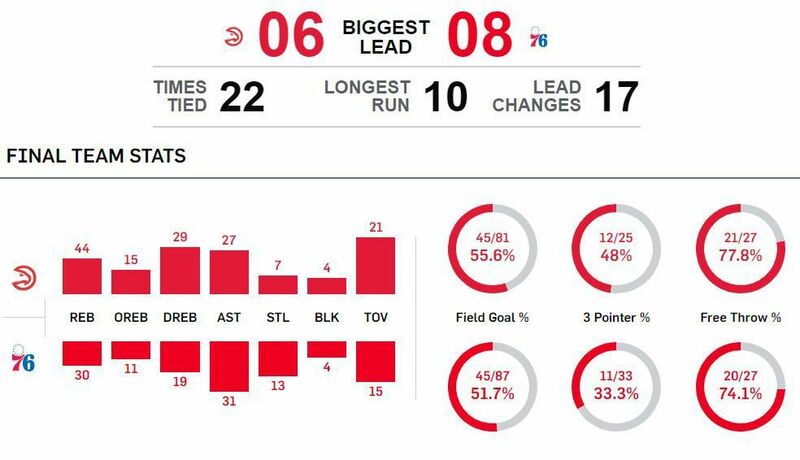 The Hawks ran off a 9-0 run to take a six point lead with 7:00 remaining, at which point the Sixers’ win probability dipped to 49.1%, the first time they were no longer favored by ESPN’s metric. Joel’s absence was certainly noticed this quarter, as the Sixers were murdered on the boards and gave up numerous easy buckets at the basket. The lineup at the start of the fourth was TJ/Landry/Jimmy/Ben/Muscala, as Muscala came back to the court after some foul trouble. Following some Jimmy free throws and a huge JJ three, the Sixers tied it up at 103 with 7:20 to go. At the 4:15 mark, Jimmy slammed home an and one alley-oop from Ben, giving the Sixers a 113-112 lead following the made free throw. Shortly after, Muscala hit his fourth three of the game, tying it up at 116 with 3:00 left, and then a rare three from TJ gave the Sixers the lead 119-118 with 2:00 to play. Jimmy got a tough two to take a three point lead, but Huerter responded with his fifth three of the game to tie it up. Following a Sixers turnover, the Hawks took a timeout with 25 seconds to go and the ball. John Collins hit a tough fadeaway two to take a two point lead with approximately ten seconds remaining. On the final possession down two, Jimmy got fouled and missed the first free throw, and the following intentional miss resulted in Wilson Chandler blowing a finish at the rim. With this loss, the Sixers drop to 27-16 on the year. They return to action on Sunday, January 13th at 1:00pm, playing the New York Knicks at the Garden. 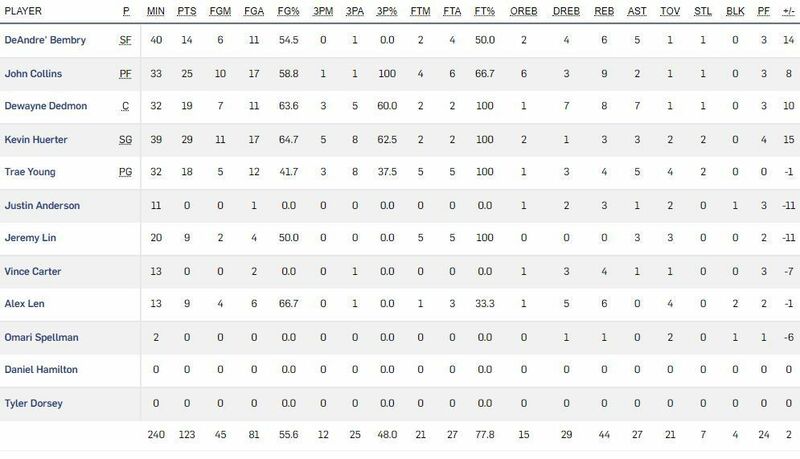 Box scores for the game are provided below. I am legally obligated to post this video despite the loss.